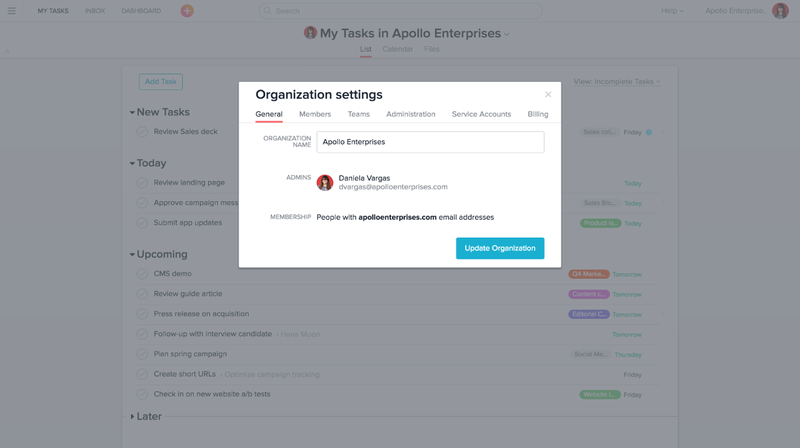 Asana is the best way for teams to track their work and get results, and it’s easy for admins and IT to manage. Follow along with our quick start guide below to set up your security controls and manage users right from the start. From the Organization settings menu, you can select from General, Members, Teams, Administration, Service Accounts, and Billing tabs, based on what you need to do. Ensure your company’s data is safe and secure by first configuring your security settings. Head to the Administration tab of the admin console. First select the login authentication settings for your Organization. You can use a regular Asana account login, Google Account login, or SAML. We recommend SAML so users have a single set of credentials to access Asana and admins can have tighter user and login management. If you don’t use SAML, make sure to set your password strength requirements in this menu. SAML is an Asana Enterprise feature. Visit our Enterprise page to learn more about all Enterprise features and benefits. Check out our Enterprise security integrations for more options. Next, it’s important to understand where to add, remove, and view members of your Organization and the teams they’re a part of. Click the orange + button in the top bar, and select Invite. Type in the email addresses of anyone you want to add. You can add multiple people at once. Then select the teams they should be a part of. An Asana invite will be sent to their email. We recommend adding people on the same teams at the same time. Before removing members from your Organization, we recommend going to their My Tasks list and reassigning their work to other teammates so it doesn’t go unaccounted for. 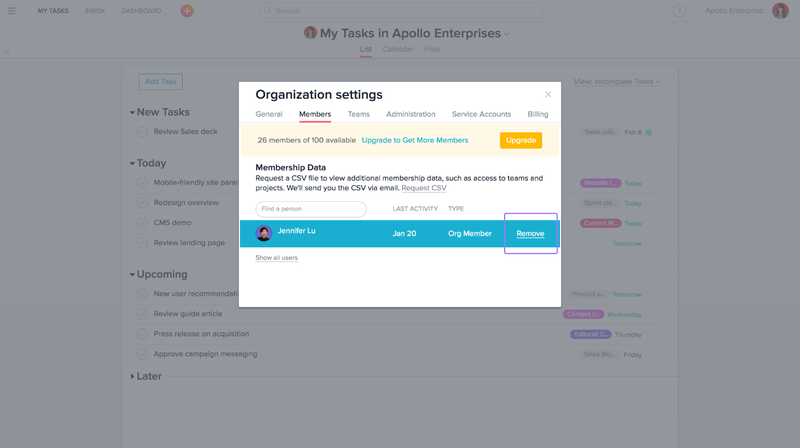 To remove a member from your Asana Organization entirely, go to the Members tab of the Organization settings menu. Next, search for their name. Once their name is pulled up, place your cursor over it, and the Remove option will appear. Confirm that you want to remove them. Once removed, they will no longer have access to your Asana Organization, but all work they have done previously will stay in Asana. Once someone is deprovisioned, any tasks assigned to them will be added to a new project that only you as the administrator can access. Also from the Members tab of Organization settings you can request a CSV export that lists all members, which teams and projects they are members of, first and last login, and more. Once requested, an email with an expiring link to access the CSV will be sent to the email you use to log in to Asana. In the Organization settings menu, click the Teams tab. Here, you can see all teams, their privacy setting (public, membership by request, or hidden), and the number of members in each team. To make any changes to the teams, click Edit. Here, you can change team names, descriptions, privacy settings, members, and more. The steps above are our top recommendations to get started, but there are lots of admin settings you can access beyond them. Below we’ve listed out what you can do in each tab of the Organization settings menu. View other admins (to change admins, go to Administration tab). See the number of open seats you have left in Asana, as well as the total number in your plan. Request a CSV file listing all members, which teams and projects they are members of, and more. View and search for members of your Organization in Asana. See a list of all teams with their privacy setting (public, membership by request, or hidden), and the number of members in each team. Edit team names, descriptions, and privacy setting. Add and remove team members on any team. Invite new and existing users to a team. Control who can approve requests to join their team. Force an Organization-wide password reset. All of your Organization’s members will immediately be logged out and asked to reset their password the next time they log in. Request a full export of your Organization’s Asana. This is a comprehensive JSON file that lists all teams, members, projects, tasks, comments, conversations, and attachments. 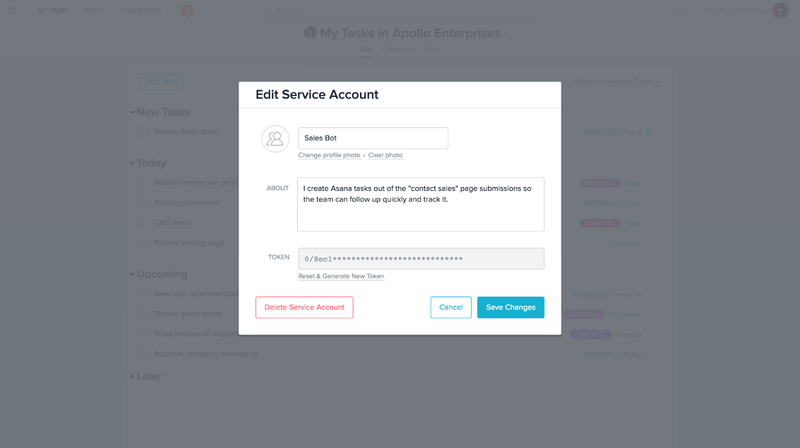 Add and remove service accounts you might use for data backups, automated administrative tasks, Asana action triggers, or to build internal integrations. Learn more in our service accounts Guide article. View your current Asana plan (Free, Premium, or Enterprise), how many seats are occupied and how many you have left. 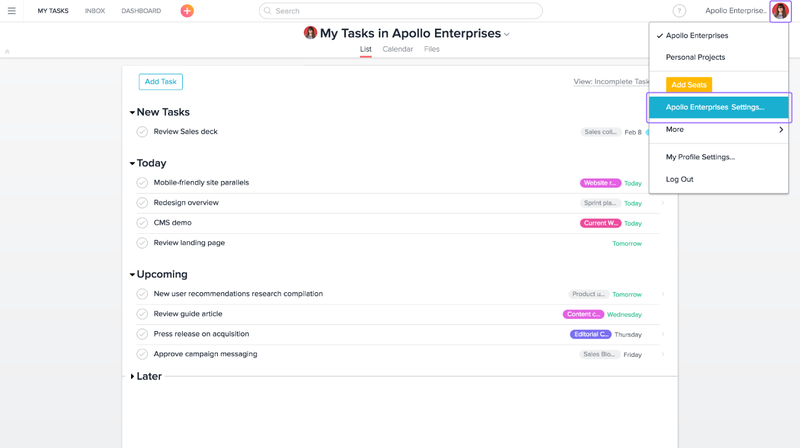 Asana integrates with lots of other apps that your organization might use. Check out our apps page to see the offerings, and have teams set up the integrations they want and need. With so many companies doing their work on the web, Asana is committed to empowering admins so they can keep their organizations secure and simple to manage. For more information, check out our privacy and security page or contact our Sales team.